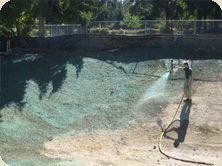 Hydroseeding is the term used to describe the process of mixing fertilized mulch and grass seed. The mixture is then sprayed on to large areas such as lawns, parks, sports fields, commercial landscaping, horse pastures, and orchards. This method of application allows municipalities and property owners to cover large areas quickly and without the high cost of sod. Our hydroseed experts have worked in Centralia and all around Lewis County for many years and possess the right equipment, knowledge, and experience to create beautiful, low-maintenance grass areas that you can enjoy for years to come. If you still have questions about hydroseeding, take a look at our library of terms. We also have a comprehensive guide to discovering which hydroseed mixture is right for different uses. For example, our horse pasture seed mixture has a lower percentage of Perennial Ryegrass than our sports field mix. And for orchards, we use a much higher seeding rate than both sports fields and horse pastures. 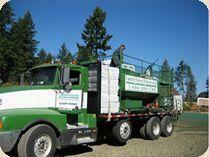 Why choose Country Green for turfgrass in Centralia, Washington? Country Green only uses high-grade products applied by experienced technicians who arrive with the appropriate seed mixture for your purposes. This means that it will have the correct ratio of grass types appropriate to the intended use, fertilizer to aid its growth, and a sticky solution that helps it stay in place until germination occurs. Controlling Erosion – Did you know that you don’t have to water hydro grass seed? This characteristic makes it perfect for steep slopes and hilly areas. And its bonding agents hold the grass in place, making it an ideal solution for areas prone to erosion. Affordability – Hydroseed mixture is applied all at once rather than in two steps (seeds and then fertilizer), which means lower labor costs for you and less time waiting for the process to be completed. The result is consistent coverage with fewer thin areas. Quick Germination – Growth occurs soon after application because the seeds are nourished, healthy, and unaffected by transport. Hand-seeding is a much slower process and runs the risk of seeds shifting around, leading to bare areas and inconsistencies. Country Green doesn’t seed and walk away. We can provide you with aftercare tips, an extra supply of specialized fertilizer, aerators, and any related landscape equipment you may need to keep your grass looking and performing the way you want it to. And because we’ve been supplying the area since 1988, we’re around for reapplications, questions, and additional aftercare advice. Give us a call today. We look forward to keeping your Centralia lawn, field, orchard, or pasture happy and healthy!